By the Commissioners for executing the office of Lord High Admiral of the United Kingdom of Great Britain and Ireland. 1. Her Majesty's Government having deemed it expedient that further attempt should be made for the accomplishment of a north-west passage by sea from the Atlantic to the Pacific Ocean, of which passage a small portion only remains to be completed, we have thought proper to appoint you to the command of the expedition to be fitted out for that service, consisting of Her Majesty's Ships "Erebus," under your command, taking with you Her Majesty's ship "Terror," her Captain (Crozier), having been placed by us under your orders, taking also with you the "Barretto Junior" transport, which has been directed to be put at your disposal for the purpose of carrying out portions of your provisions, clothing and other stores. 2. On putting to sea, you are to proceed, in the first place, by such a route as from the wind and weather, you may deem to be the most suitable for despatch, to Davis' Strait, taking the transport with you to such a distance up the Strait as you may be able to proceed without impediment from ice, being careful not to risk the vessel by allowing her to be set in the ice, or exposed to any violent contact with it ; you will then avail yourself of the earliest opportunity of clearing the transport of the provisions and stores with which she is charged for the use of the expedition, and you are then to send her back to England, giving to the agent or master such directions for his guidance as may appear to you most proper, and reporting by that opportunity your proceedings to our secretary, for our information. 3. You will then proceed in the execution of your orders into Baffin's Bay, and get as soon as possible to the western side of the Strait, provided it should appear to you that the ice chiefly prevails on the eastern side, or near the middle ; but as no specific directions can be given, owning to the position of the ice varying from year to year, you will, of course, be guided by your own observations as to the course most eligible to be taken, in order to ensure a speedy arrival in the Sound above mentioned. 4. As, however, we have thought fit to cause each ship to be fitted with a small steam-engine and a propeller, to be used only in pushing the ships through channels between masses of ice, when the wind is adverse, or in a calm, we trust the difficulty usually found in such cases will be much obviated, but as the supply of fuel to be taken in the ships is necessarily small you will use it only in cases of difficulty. 5. Lancaster Sound, and its continuation through Barrow's Strait, having been four times navigated without any impediment by Sir Edward Parry, and since frequently by whaling ships, will probably be found without any obstacles from ice or islands ; and Sir Edward Parry having also proceeded from the latter in a straight course to Melville Island, and returned without experiencing any, or very little, difficulty, it is hoped that the remaining portion of the passage, about 900 miles, to the Bhering's Strait may also be found equally free from obstruction ; and in proceeding to the westward, therefore, you will not stop to examine any openings either to the northward or southward in that Strait, but continue to push to the westward without loss of time, in the latitude of about 74 ¼ degrees, till you have reached the longitude of that portion of the land on which Cape Walker is situated, or about 98 degrees west. From that point we desire that every effort be used to endeavour to penetrate to the southward and the westward in a course as direct towards Bhering's Strait as the position and extent of the ice, or the existence of land, at present unknown, may admit. 6. We direct you to this particular part of the Polar Sea as affording the best prospect of accomplishing the passage to the Pacific, in consequence of the unusual magnitude and apparently fixed state of the barrier of ice observed by the "Hecla" and the "Griper," in the year 1820, off Cape Dundas, the south-western extremity of Melville Island ; and we, therefore, consider that loss of time would be incurred in renewing the attempt in that direction ; but should your progress in the direction before ordered be arrested by ice of a permanent appearance, and that when passing the mouth of the Strait, between Devon and Cornwallis Islands, you had observed that it was open and clear of ice ; we desire that you will duly consider, with reference to the time already consumed, as well as to the symptoms of a late or early close of the season, whether that channel might not offer a more practicable outlet from the Archipelago, and a more ready access to the open sea, where there would be neither islands nor banks to arrest and fix the floating masses of ice ; and if you should have determined to winter in that neighbourhood, it will be a matter of your mature deliberation whether in the ensuing season you would proceed by the above-mentioned Strait, or whether you would persevere to the south-westward, according to the former directions. 7. You are well aware, having yourself been one of the intelligent travellers who have traversed the American shore of the Polar Sea, that the groups of islands that stretch from that shore to the northward to a distance not yet known, do not extend to the westward further than about the 120th degree of western longitude, and beyond this, and to Bhering's Strait, no land is visible from the American shore of the Polar Sea. 8. Should you be so fortunate as to accomplish a passage through Bhering's Strait, you are then to proceed to the Sandwich Islands, to refit the ships and refresh the crews, and if, during your stay at such place, a safe opportunity should occur of sending one of your officers or dispatches to England by Panama, you are to avail yourself of such opportunity to forward to us as full a detail of your proceedings and discoveries as the nature of the conveyance may admit of, and in the event of no such opportunity offering during your stay at the Sandwich Islands, you are on quitting them to proceed with the two ships under your command off Panama, there to land an officer with such dispatches, directing him to make the best of his way to England with them, in such a manner as our Consul at Panama shall advise, after which you are to lose no time in returning to England by way of Cape Horn. 9. If at any period of your voyage the season shall be so far advanced as to make it unsafe to navigate the ships, and the health of your crews, the state of the ships, and all concurrent circumstances should combine to induce you to form the resolution of wintering in those regions, you are to use your best endeavours to discover a sheltered and safe harbour, where the ships may be placed in security for the winter, taking such measures, for the health and comfort of the people committed to your charge as the materials with which you are provided for housing in the ships, may enable you to do - and if you should find it expedient to resort to this measure, and you should meet with any inhabitants, either Esquimaux or Indians, near the place where you winter, you are to endeavour by every means in your power to cultivate a friendship with them, by making them presents of such articles as you may be supplied with, and which may be useful or agreeable to them ; you will, however, take care not to suffer yourself to be surprized by them but use every precaution, and be constantly on your guard against any hostility ; you will, by offering rewards, to be paid in such a manner as you may think best, prevail on them to carry to any of the settlements of the Hudson's Bay Company, an account of your situation and proceedings, with an urgent request that it may be forwarded to England with the utmost possible dispatch. 10. In an undertaking of this description much must be always left to the discretion of the commanding officer, and, as the objects of this Expedition have been fully explained to you, and you may have already had much experience on service of this nature, we are convinced we cannot do better than leave it to your judgement, in the event of your not making the passage this season, either to winter on the coast, with the view of following up next season any hopes or expectations which your observations this year may lead you to entertain, or to return to England to report to us the result of such observations, always recollecting our anxiety for the health, comfort and safety of yourself, your officers and men ; and you will duly weigh how far the advantage of starting next season from an advanced position may be counterbalanced by what may be suffered during the winter, and by the want of such refreshment and refitting as would be afforded by your return to England. 11. We deem it right to caution you against suffering the two vessels placed under your orders to separate, except in the event of accident or unavoidable necessity, and we desire you to keep up the most unreserved communications with the commander of the "Terror," placing in him every proper confidence, and acquainting him with the general tenor of you orders, and with your views and intentions from time to time in the execution of them, that the service may have the full benefit of your united efforts in the prosecution of such a service ; and that, in the event of unavoidable separation, or of any accident to yourself, Captain Crozier may have the advantage of knowing, up to the latest practicable period, all your ideas and intentions relative to satisfactory completion of this interesting undertaking. 12. 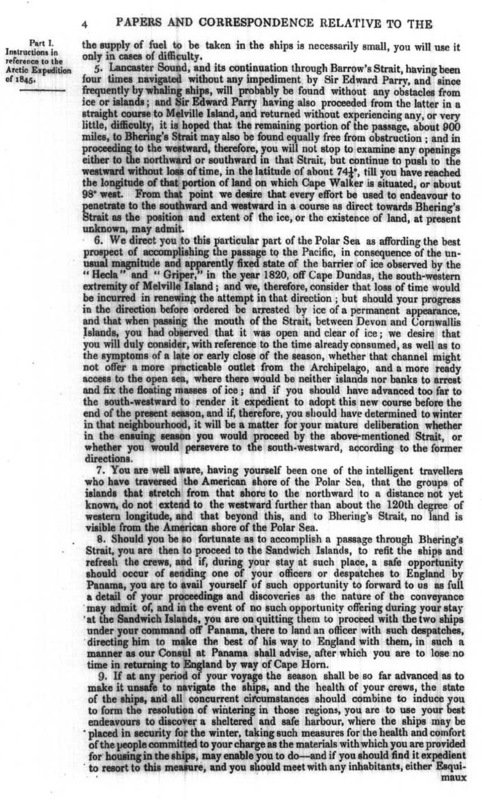 We also recommend, that as frequent an exchange take place as conveniently may be of the observations made in the two ships ; that any scientific discovery made by the one, be as quickly as possible communicated for the advantage and guidance of the other, in making their future observations, and to increase the probability of the observations of both being preserved. 13. We have caused a great variety of valuable instruments to be put on board the ships under your orders, of which you will be furnished with a list, and for the return of which you will be held responsible ; among these, are instruments of the latest improvements for making a series of observations on terrestrial magnetism, which are at this time peculiarly desirable, and strongly recommended by the President and the Council of the Royal Society, that the important advantage be derived from observations taken in the North Polar Sea, in co-operation with the observers who are at present carrying on an uniform system at the magnetic observatories established by England in her distant territories, and, through her influence, in other parts of the world ; and the more desirable is this co-operation in the present year, when these splendid establishments, which do so much honour to the nations who have cheerfully erected them at a great expense, are to cease. The only magnetical observations that have been obtained very partially in the Arctic Regions, are now a quarter of a century old, and it is known that the phenomena are subject to considerable secular changes. 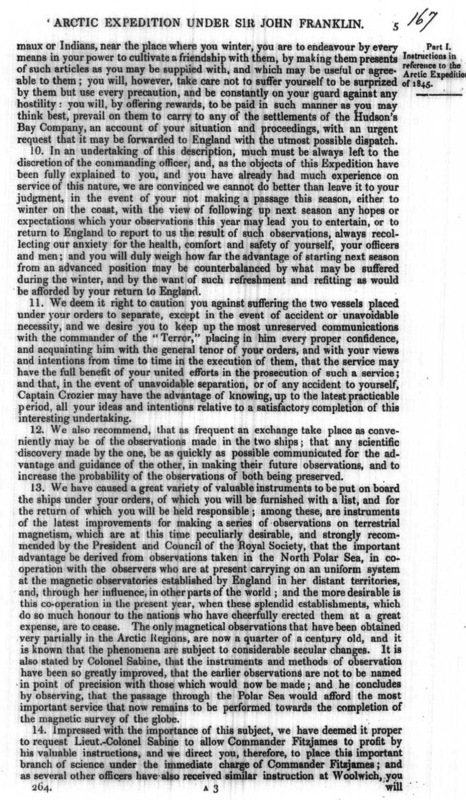 It is also stated by Colonel Sabine, that the instruments and methods of observation have been so greatly improved, that the earlier observations are not to be named in point of precision with those which would now be made ; and he concludes by observing, that the passage through the Polar Sea would afford the most important service that now remains to be performed towards the completion of the magnetic survey of the globe. 14. Impressed with the importance of this subject, we have deemed it proper to request Lieut.-Colonel Sabine to allow Commander Fitzjames to profit by his valuable instructions, and we direct you, therefore, to place this important branch of science under the immediate charge of Commander Fitzjames; and as several other officers have also received similar instruction at Woolwich, you will therefore cause observations to be made daily on board each of the ships whilst at sea (and when not prevented by weather, and other circumstances) on the magnetic variation, dip and intensity, noting at the time the temperature of the air, and of the sea at the surface, and at different depths; and you will be careful that in harbour and on other favourable occasions those observations shall be attended to, by means of which the influence of the ship's iron on the result obtained to sea may be computed and allowed for. 15. In the possible event of the ships being detained during a winter in the high latitudes, the expedition has been supplied with a portable observatory, and with instruments similar to those which are employed in the fixed magnetical and meteorological observatories instituted by Her Majesty's Government in several of the British colonies. 16. 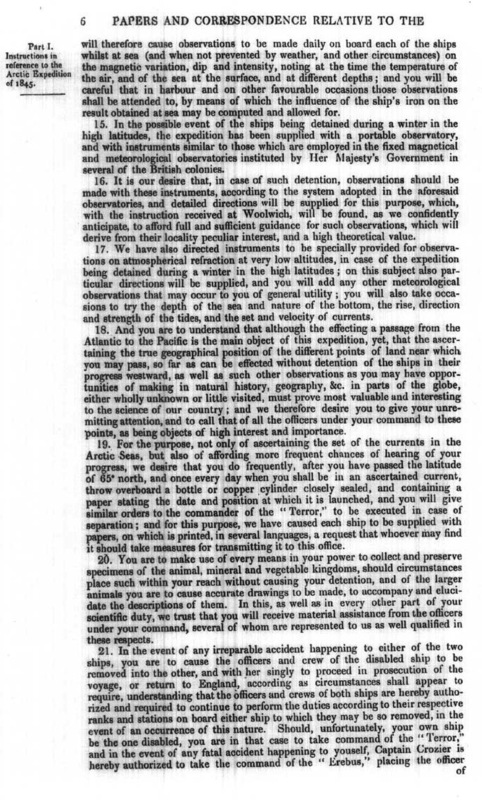 It is our desire that, in case of such detention, observations should be made with these instruments, according to the system adopted in the aforesaid observatories, and detailed directions will be supplied for this purpose, which with the instruction received at Woolwich, will be found, as we confidently anticipate, to afford full and sufficient guidance for such observations, which will derive from their locality, peculiar interest, and high theoretical value. 17. We have also directed instruments to be specially provided for observations on atmospherical refraction at very low altitudes, in case of the expedition being detained during a winter in the high latitudes ; on this subject also particular directions will be supplied, and you will add any other meteorological observations that may occur to you of general utility ; you will also take occasions to try the depth of the sea and nature of the bottom, the rise, direction and strength of the tides, and the set and velocity of currents. 18. And you are to understand that although the effecting a passage from the Atlantic to the Pacific is the main object of this expedition, yet, that the ascertaining the true geological position of the different points of land near which you may pass, so far as can be effected without detention of the ships in their progress westward, as well as such other observations as you may have opportunities of making in natural history, must prove most valuable and interesting, and to call that of all the officers under your command to these points, as being objects of high interest and importance. 19. For the purpose, not only of ascertaining the set of the currents in the Arctic Seas, but also of affording more frequent chances of hearing your progress, we desire that you frequently, after you have passed the latitude of 65 degrees north, and once every day when you shall be in an ascertained current, throw overboard a bottle or copper cylinder closely sealed, and containing a paper stating the date and position at which it is launched, and you will give similar orders to the commander of the "Terror," to be executed in case of separation ; and for this purpose, we have caused each ship to be supplied with papers, on which is printed, in several languages, a request that whoever may find it should take measures for transmitting it to this office. 20. You are to make use of every means in your power to collect and preserve specimens of animal, mineral and vegetable kingdoms, should circumstances place such within your reach without causing your detention, and of the larger animals you are to cause accurate drawings to be made, to accompany and elucidate the descriptions of them. In this, as well as in every other part of your scientific duty, we trust that you will receive material assistance from the officers under your command, several of whom are represented to us as well qualified in these respects. 21. In the event of any irreparable accident happening to either of the two ships, you are to cause the officers and crew of the disabled ship to be removed into the other, and with her singly to proceed in prosecution of the voyage, or return to England, according as circumstances shall appear to require, understanding that the officers and crews of both ships are hereby authorized and required to continue to perform the duties according to their respective ranks and stations on board either ship to which they may be removed, in the event of an occurrence of this nature. Should, unfortunately, your own ship be the one disabled, you are in that case to take command of the "Terror," and in the event of any fatal accident happening to yourself, Captain Crozier is hereby authorized to take command of the "Erebus," placing the officer of the expedition who may then be next in seniority to him in command of the "Terror." Also, in the event of your own inability, by sickness or otherwise, of any period of service, to continue to carry these instructions into execution, you are to transfer them to the officer next in command to you employed on the expedition, who is hereby required to execute them in the best manner he can for the attainment of the several objects herein set forth. 22. 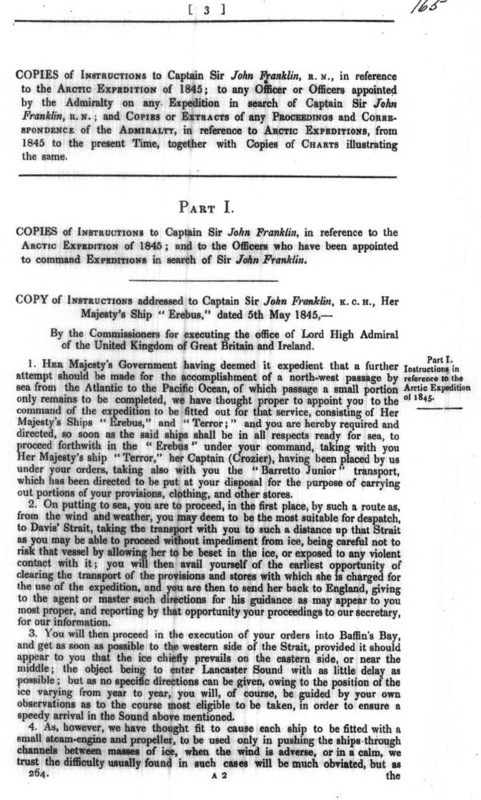 You are, while executing the service pointed out in these instructions, to take every opportunity that may offer of acquainting our secretary, for our information, with your progress, and on your arrival in England, you are immediately to repair to this office, in order to lay before us a full account of your proceedings in the whole course of your voyage, taking care before you leave the ship to demand from the officers, petty officers, and all other persons on board, the logs and journals they may have kept, together with any drawings or charts they may have made, which are all sealed up, and you will issue similar directions to Captain Crozier and his officers. The said logs, journals or other documents to be thereafter disposed of as we may think proper to determine. 23. 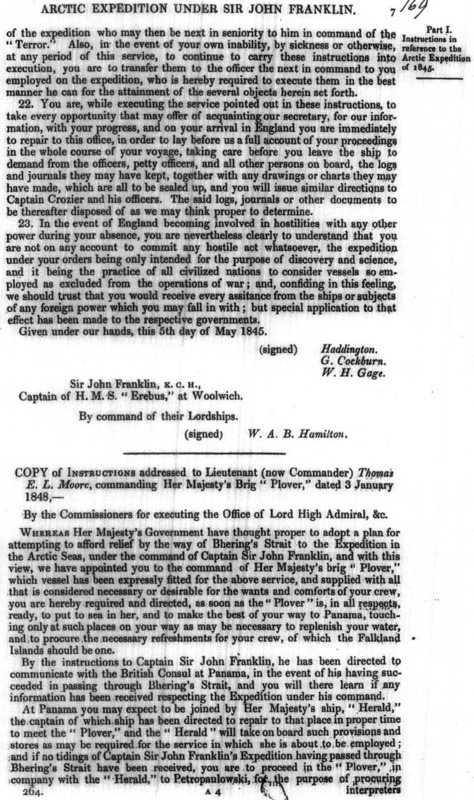 In the event of England becoming involved in hostilities with any other power during your absence, you are nevertheless clearly to understand that you are not on any account to commit any hostile act whatsoever, the expedition under your orders being only intended for the purpose of discovery and science, and it being the practice of all civilized nations to consider vessels so employed as excluded from the operations of war ; and, confiding in this feeling, we should trust that you would receive every assistance from the ships or subjects of any foreign power which you may fall in with ; but special application to that effect has been made to the respective governments. Given under our hands, this 5th day of May 1845. Sir John Franklin, K. C. H.